In July of this year the world famous Escola Portuguesa de Arte Equestre (EPAE), opened a new performing arena in Belem, Lisbon. A historical place related to cavalry, both military and royal, the School has restored an arena that belonged to the Army- The Henrique Calado Riding Ring. The inauguration was on July 16th and since then the School is performing regularly to the public. I recently interviewed one of the members of this historical riding school, Carlos Tomas, about the re-opening, and what viewers can now expect from this unique experience. “The public can attend the morning exercise, performances or even gala shows, depending on the day and the response has been very good, although as there is construction work in the street just in front of the ring, it has been a bit confusing for us, for the horses, and for the public. Hoping that the construction will be completed by the end of the month, Carlos feels that this will then make a calmer entrance and one more publicly accessible. Having trained with Master Rodrigues when I first arrived in Portugal, I was thrilled to hear he had taken the spot as head rider, knowing that his horsemanship, passion and talent, would surely lift the school to a new level. “Since I was a kid I liked to see the School shows,” added Carlos. Carlos hopes that with this new arena and new management more people will begin taking notice of the School and it’s existence, and people will take the time to witness the hard work and talent of Carlos and his peers. 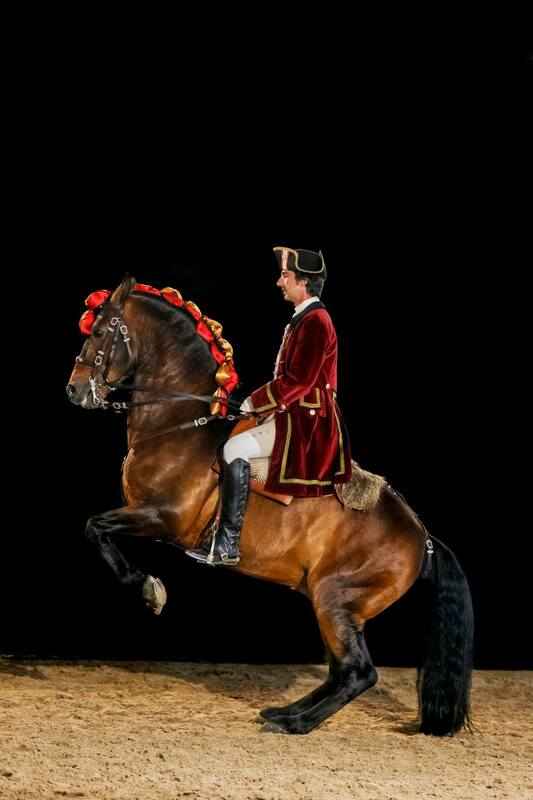 “The audience is offered the chance to see the Alter Real (royal stud) Lusitanos performing all the High School exercises practiced at the “Picaria Real” (the Portuguese Equestrian Academy of King João V that used the Royal Riding Ring in Belém, actually the National Coach Museum). These include the passage, the pirouette, the tempi changes and also the “airs above the ground”-the pinnacle of the baroque riding-such as the levade, the pousada, the courbette, the ballotade and the capriole. I would urge anyone who would like to witness true equestrian beauty to head to Belem and support something truly great, the product of talent, history, and passion for classical training. Click here to view the program, available at www.arteequestre.pt!